Members of the Marvel Cinematic Universe are in mourning over the news of Stan Lee's death; The pop culture icon, who founded Marvel Comics and served as its editor, publisher and writer, was 95 years old. Lee is preceded in death by his wife of 69 years, who died in July 2017. Bob Iger, chairman and CEO of The Walt Disney Company, honored the comic book legend via social media. "Stan Lee was as extraordinary as the characters he created. A super hero in his own right to Marvel fans around the world, Stan had the power to inspire, to entertain, and to connect," he tweeted. "The scale of his imagination was only exceeded by the size of his heart." "We at Stan Lee's Lee POW! Entertainment are saddened by the loss of our friend and mentor Stan Lee, the father of pop culture. His passing today marks a devastating and painful moment in time, but the legacy of Stan Lee, through his creative genius and his universes of characters, will continue to reach the world of true believers for generations to come. Our thoughts and prayers are with his family and the fans of not only his work, but of him, as a friend who made the world a better place," Shane Duffy, POW! Entertainment's CEO, said in a statement. "He was a true iconic pioneer with no comparable second. It has been an honor to work beside him." Lee's long-time publicist, Dawn Miller, also issued a statement to E! News Monday afternoon. "Stan Lee was a tremendous character that will never be forgotten. He brought joy to so many, the world has lost a true legend," Miller said. "I feel honored to have worked with him for so many years and witnessed the magic of his charisma and creative genius, may he rest in peace." "No one has had more of an impact on my career and everything we do at Marvel Studios than Stan Lee. Stan leaves an extraordinary legacy that will outlive us all," Kevin Feige, president of Marvel Studios, added. "Our thoughts are with his daughter, his family and his millions of fans." "I owe it all to you," the Iron Man actor wrote on Instagram. "Rest in peace, Stan." "There will never be another Stan Lee," tweeted Evans, who began playing Captain America in 2011. "For decades he provided both young and old with adventure, escape, comfort, confidence, inspiration, strength, friendship and joy. He exuded love and kindness and will leave an indelible mark on so, so, so many lives. Excelsior!!" "The galaxy just gained another Dog Star," the actress, who plays Black Widow in multiple films, told E! News in a statement. "Thankful everyday to be a small part of Stan's universe. He was a legendary visionary and a true artist." "Damn...RIP Stan," the Deadpool actor wrote on Instagram. "Thanks for everything." "RIP, Stan Lee. Thank you for sharing your incredible vision with us. We are eternally grateful to you and would not be the same without it," tweeted Berry, who played Storm in three X-Men movies. "I am so honored to have played a part in your world and will forever look back on the opportunity with love." "We've lost a creative genius. Stan Lee was a pioneering force in the superhero universe," Jackman, who began playing X-Men's Wolverine in 2000, wrote on Instagram. "I'm proud to have been a small part of his legacy and to have helped bring one of his characters to life." "Now that was a life well lived and lived to its fullest. Excelsior! 1922-2018," the actor, who played Vision in multiple films, wrote on Instagram. "‪Thank you Stan Lee, from all your fans." "Today we lost one of the greats. Stan Lee, you were an inspiration and superhero to us all," the actress, who played Gamora in the Guardians of the Galaxy films, wrote on Instagram. "Thank you for contributing so much- and giving us all something to aspire to!" "RIP my friend. Thank you for the incredible adventures your stories took all of us on," Hemsworth, who played Thor, tweeted. "My love and support goes out to all your friends and family." "Stan Lee created a universe where, if a character was beloved enough, they could never really die. Now THAT'S thinking ahead," the Avengers and Avengers: Age of Ultron director tweeted. "Thanks for so much of my life. You'll never not be in it." "On set right now and just heard the news. Stan gave us so much joy, and not just as an exceptional storyteller and artist, but also through his work with his foundation," the actor, who plays War Machine, tells E! news. "His 'Tony Stank' line will live with us forever. Rest in power, friend." "Stan...more than a master of stories, you always seemed like a master of living," the star of Ant-Man and the Wasp wrote on Instagram. "I will look to you for inspiration for the rest of my life. You live on. xoxo Your Wasp." "Thanks for everything Stan Lee! What a life, so well lived," Pratt, who played Star-Lord in Guardians of the Galaxy, wrote on Twitter. "I consider myself extraordinarily lucky to have gotten to meet you and to have played in the world you created." "I am saddened to learn about the passing of Stan Lee. From watching Marvel films with my friends in college to having the privilege to take on one of his characters in Black Panther, Stan's creative genius sparked my imagination and left me in awe," the actress, who played Nakia, wrote on Instagram. "His legacy will carry on in all of us who relish in the worlds he created. Worlds that renew our spirits and help us cope with our own." "Stan Lee and Dr. Seuss and Ray Bradbury. That's where it begins and ends with me," Brolin, who played both Cable and Thanos onscreen, wrote on Instagram. "To those of us who have been so deeply affected by the humanity of his imagination, the understanding of reaching beyond our potential and the necessity of tapping into our immeasurable imaginations, we thank you and are forever indebted. Rest in peace, dear Stan. You made our time here a better one." "He was a friend. When we were afraid, he gave us strength. When we were alone, he gave us a family," the actress, who played Mystique in the X-Men films, tweeted. "He may be gone, but his teachings live on through us, his students. Wherever we may go, we must carry on his vision. And that is a vision of a world united. RIP Stan Lee." "Thank you great legend. You will be missed," Stan, who plays Winter Soldier, wrote on Instagram. "I wouldn't be here without you." "Sweet, sweet Stan. You gave people all around the world something to believe in. Something bigger than themselves," Bennet, who plays Quake on Marvel's Agents of S.H.I.E.L.D., wrote on Instagram. "You taught us that you don't need to have powers to be super. That a big heart and kindness can change the world. You made everyone around you come to life with laughter and joy. I will miss the giggles. Thank you for all you have given us, you will be missed. RIP." "Sad, sad day. Rest in power, Uncle Stan. You have made the world a better place through the power of modern mythology and your love of this messy business of being human. You let us be extra human...superhuman even," the actor, who played The Hulk in multiple movies, wrote on Instagram. 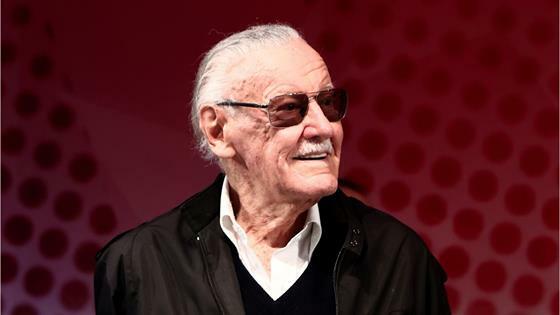 "I am deeply honored to have been a small part in the Stan Lee constellation." "I just heard about Stan Lee. He will be so missed," the actress, who played Pepper Potts in the Iron Man movies, wrote on Instagram. "What a genius, and always so lovely. True gentleman." "How many millions of us are indebted to this guy? None more so than me. The father of Marvel has made so many people so incredibly happy," said Holland, who is the third actor to play Spider-Man on the big screen. "What a life and what a thing to have achieved. Rest in peace, Stan." "You were always so kind and enthusiastic and a delight to be around," said Atwell, who played Agent Peggy Carter. "Thank you, Stan. For all these much loved characters." "What can I say about the loss of a visionary who created one of my favorite characters I've ever played? Like a lot of us, I just figured Stan Lee would live forever, yet his fun loving wit, charm, and poetic legacy lives on for generations to come," Jones, who starred in Fantastic Four: Rise of the Sivler Surfer, wrote on Instagram. "My heart hurts, and he will be sorely missed." "Stan Lee. A gentleman and a genius," tweeted Dennings, who played Darcy Lewis in the Thor films. "It was an honor to be a small part of his universe. Rest in peace." On Instagram, the Iron Fist star wrote, "Thank you for your imagination, passion and humor." "Onward and upward to greater glory!" tweeted Basset, who played Ramonda, Queen Mother of Wakanda, in Black Panther. "Excelsior! Good man, Excelsior!" "Stan Lee was a brilliant, kindhearted gent whose stories thrilled me as a kid," he wrote on Instagram. "I was utterly starstruck when I met him and I will never forget that though Phil Coulson was one of the few MCU characters who did not appear in the original comics, he always treated me like one of his own." "The legend himself. Thank you for all you gave us," the actress, who played MJ in Spider-Man: Homecoming, wrote on Instagram. "I could not be more honored to be a very small piece of your world. Rest in superpower." "Was an honor my friend. Rest easy. Thanks for letting me play," the actor, who plays The Punisher on Netflix, wrote on Instagram. "Thanks for giving us so much. You will be missed." "RIP Stan Lee. True legend. He spoke up against injustices through his stories; where good prevails over evil," Chung, who plays Blink on Gifted, wrote on Instagram. "It was an honor working for you." "Thank you, Stan Lee. You gave us characters that continue to stand the test of time and evolve with our consciousness," the actor, who played M'baku in Black Panther, tweeted. "You taught us that there are no limits to our future as long as we have access to our imagination. Rest in power!" "You made heroes out of women; I am so grateful to have been one of them," Garner, who played Elektra in Daredevil, wrote on Instagram. "Thank you, Stan Lee. RIP." "Taking a moment to thank the great Stan Lee for his kindness," the actress wrote on Instagram. "It was a huge honor to be part of your universe. The experience I had on The Fantastic Four playing Sue Storm/Invisible Woman was so meaningful as a young actress and made a huge impact on me. We will miss you, Stan Lee." "I am so grateful to have known and worked with this man, even briefly, over the years," said Levi, who played Fandral in two Thor films. "He quite literally changed the landscape of entertainment forever. The term 'legend' seems to get thrown around a lot these days, but this man is most deserving of it. Thank you for everything, Stan. May the heavens be made more colorful with your arrival. Excelsior." "Overwhelmed with love and gratitude for the late, great hero, Stan Lee. Rest in paradise," the actress, who played nurse Claire Temple in multiple Netflix series, wrote on Instagram. "Thank you for your imagination, creativity, tenacity, inspiration and love!!!" "The legend: Stan Lee. Very blessed to have known you," the actor, who played Quicksilver in Avengers: Age of Ultron, wrote on Instagram. "Thank you for all the heroes you assembled and gifted us." "Stan the man. RIP," Sulkin, who plays Chase Stain in Hulu's Runaways, wrote on Instagram Stories. "Thank you for creating a special place for people to enjoy and work for, including me. Forever grateful." "Stan Lee created one of the first characters I ever played on film and endless others that have inspired me and now my kids," Banks, who played Betty Brant in Spider-Man 3, wrote on Instagram. "Legend." "Legend. Godspeed, Stan. I feel blessed to have known you," the actor, who played Skurge in Thor: Ragnarok, wrote on Instagram. "You made this place better and brought joy to everyone you met. Rest in peace." "Rest in peace, Stan Lee," the actress, who played Colleen Wing in Netflix's Iron Fist, wrote on Instagram. "Such an inspiration to so many people. Changed the world as we know it." "Thank you for filling our childhoods with such joy," the directing duo wrote on Instagram. "You will be dearly, dearly missed..."
"Stan Lee gave so much to this world and to me personally. He always had a smile on his face and so much positive energy," Munn, who played Psylocke in X-Men: Apocalypse, tweeted. "I'll miss our lunches and our talks. Rest in love, Stan." "RIP, Stan Lee. He was one of my idols. One of the most prolific and influential authors of our time. His stories taught and entertained. And his characters made this nerd feel a part of a tribe of beautiful, wonderful weirdos," the actor, who played Dr. Dan Lewis in Venom, tweeted. "Thank you Stan. For everything." "Dear Stan, thank you for your imagination and incredible ability to see the superhero within all of us, painting such wonderful stories of hope and humor," the actress, who plays Jemma Simmons on Marvel's Agents of S.H.I.E.L.D., wrote on Instagram. "You will be missed enormously but your spirit will live on in the most magical way—bringing stories and characters of inspiration, inclusion and the funniest one liners. Being able to get to work with you and hang out was a dream come true. I've never met someone with so much wit and charisma whilst also having the most humility. Plus, we filmed a scene on a moving train and you didn't miss a beat whilst I was clumsily falling over all over the place. Thank you for all your advice and the inspiration you leave all of us with. RIP. One of a kind." "At a young age Stan Lee opened my eyes to the power of fantasy," the actor, who plays Victor Stein in Runaways, tweeted. "He made me want to be a hero. Fly free, Stan!" "RIP, Stan Lee," the actress, who played Liz Allan in Spiderman: Homecoming, wrote on Instagram. "I am so honored to have been able to bring one of your characters to life!" "Heartbroken. Stan Lee represents the best of us," tweeted Green, who had a cameo as Howard the Duck in a Guardians of the Galaxy post-credits scene. "How grateful I am for his existence and influence. He lived to see his creations shape the world, and his legacy will inspire generations to come. But I'll miss him. EXCELCIOR!!" E! News will update this story as more tributes pour in throughout the day.